Is US Foreign policy for sale? In August 2008, war broke out between Georgia and Russia in South Ossetia conflict estimated to have killed hundreds and displaced 118,000 during five days. But three years later, the Georgian government still enjoys broader support from American politicians and media — thanks in part to the efforts of Washington, DC lobbyists. "It certainly took a few days for the press and people in Congress to say: 'Hold on, it actually seems Georgia was the one who has started this conflict and Russia's response was disproportionate, but we want to think twice about saying we want to go all in and declaring we are all Georgians as (John) McCain did and that's not necessarily in the US's interest," said Zachary Roth, senior foreign affairs reporter for Yahoo! News. Documents filed with the US Justice Department show that since 2004, the government of Georgia has paid lobbyists in Washington to maintain close ties with the US as its democratic ally in the region, even after violent crackdowns on anti-government demonstrators in 2007 and 2011, and elections that were criticized for their irregularities by the Organization for Security Cooperation in Europe in 2008. "A lot of the message to be delivered before and during the war is 'Mikael Saakashvili is the Thomas Jefferson of that part of the world, he is a democrat, he is pro-American. He supports our values.' So let's not look at little details about how he treats his polticial opposition or how he treats the media in Georgia." Saakashvili denied paying lobbyists in an interview with BBC's Hardtalk on September 18, 2008. "What millions of dollars? What lobbyists?" Saakashvili told the BBC. "We are a small country that is trying to survive in very tough geopolitical environments." 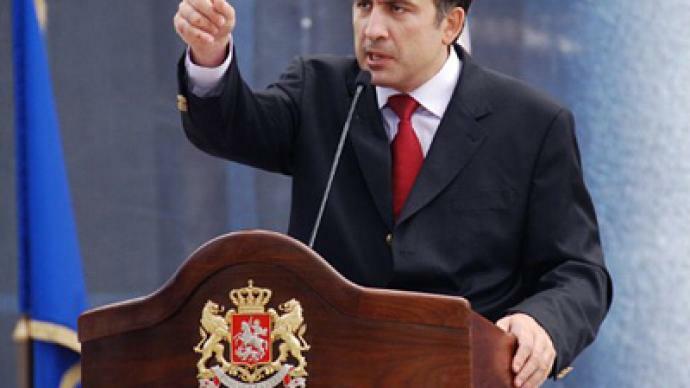 But documents filed with the US Justice Department show that lobbyists employed by the Government of Georgia set up a variety of meetings with the media, politicans and business leaders on behalf of Saakashvili. When the war broke out in 2008, John McCain told campaign supporters he spoke with Saakashvili to express his support. "The thoughts and prayer of the American people are with that brave little nation," McCain said. Documents filed with the Justice Department also show that McCain’s top foreign policy advisor Randy Scheunemann’s firm worked for the government of Georgia while Scheneumann worked on McCain’s campaign. "My work in the campaign was separate and distinct as my work as a lobbyist," Scheunemann told RT America. But critics like Roth say the distinction between policy advisor and foreign government lobbyists is a tough one to make. "John McCain is one of those Republican leaders and remains one of those leaders on foreign policy issues. And it certainly tells you something that his worldview is being shaped very closely by a guy like Randy Scheunemann, who not only has a personal financial stake in promoting the interests of the Georgian government."